This Greek yogurt fruit dip recipe is delicious, and so easy to make! 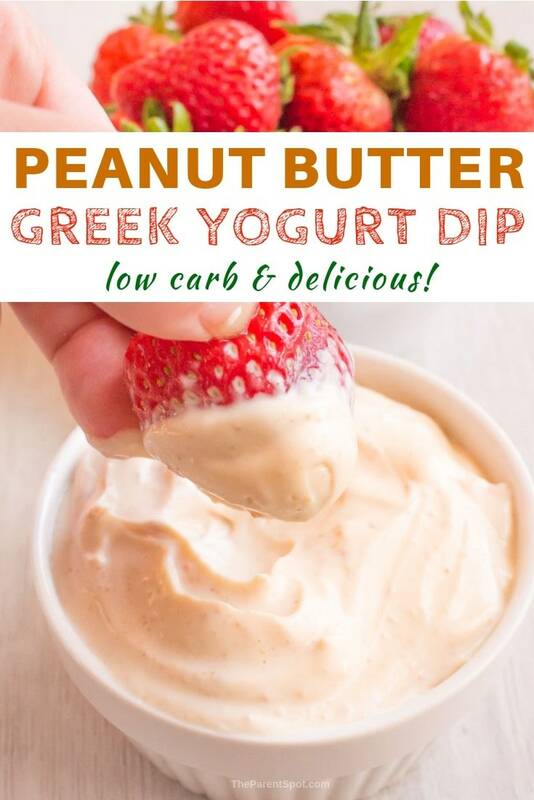 You will love this low carb peanut butter Greek yogurt dip, made with only three ingredients! 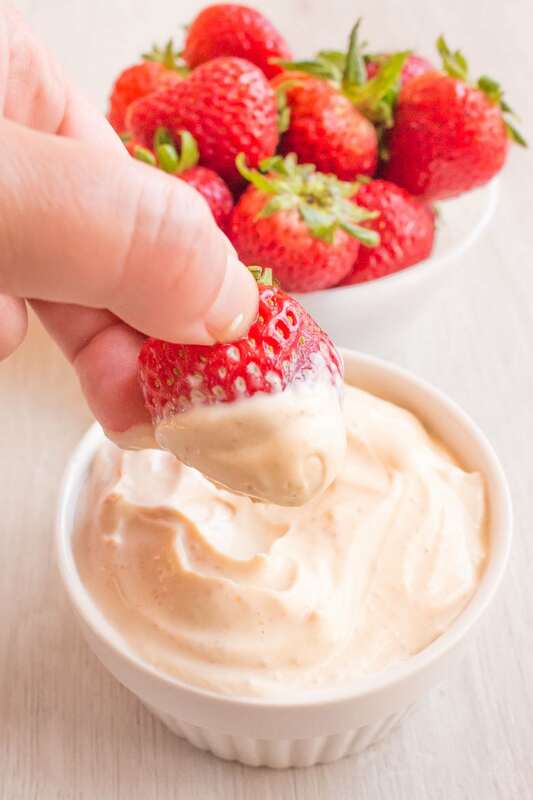 I love to serve this delicious, high protein dip with strawberries and apples, but really any fresh fruit goes well. Bananas, pineapple, raspberries, blackberries, and grapes are especially good, but let your imagination go wild. Love dips? We do too! Check out our yummy caramel apple dip or delicious fondue recipes. 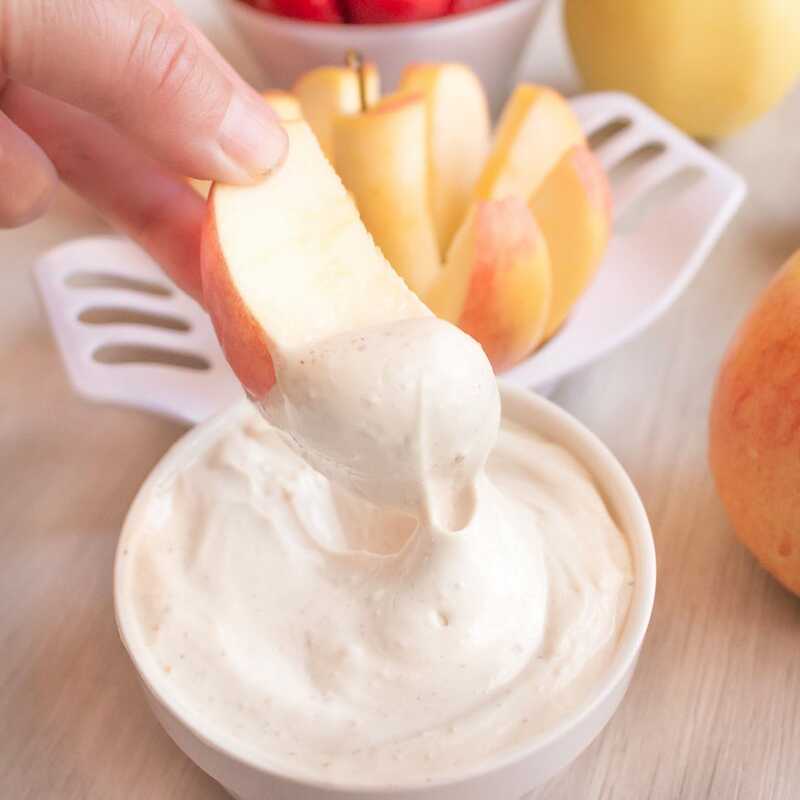 Not only is this dip so, so, good, but it’s crazy easy to make, with only three ingredients – Greek yogurt, natural peanut butter, and honey (or Stevia). The success of this dip really lies in the quality of the Greek yogurt you choose. Choose a Greek yogurt that’s rich and creamy. This isn’t the place to skimp, or you’ll taste it in the final product. We used natural peanut butter here, because regular commercial peanut butter has a lot of added sugar, preservatives, and fat. 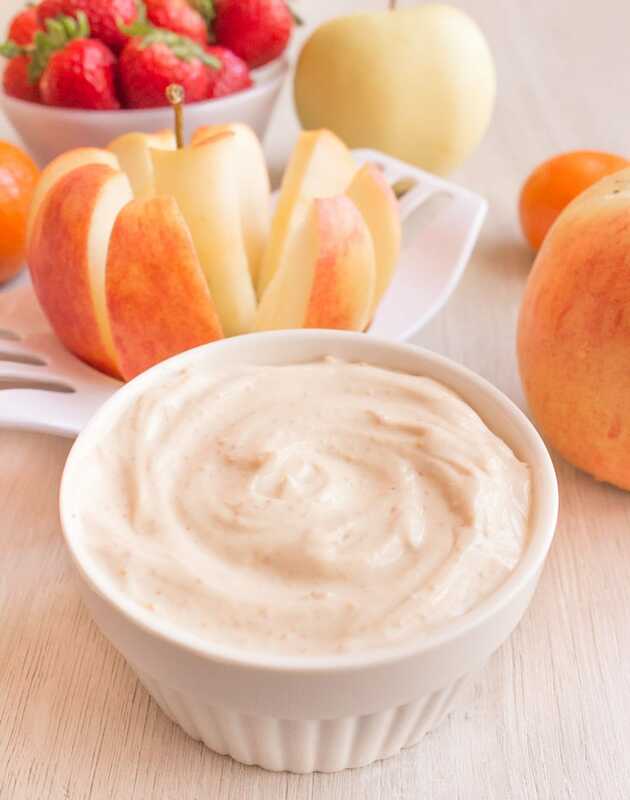 Plus, natural peanut butter is absolutely delicious, and makes this peanut butter fruit dip healthier and so creamy good! 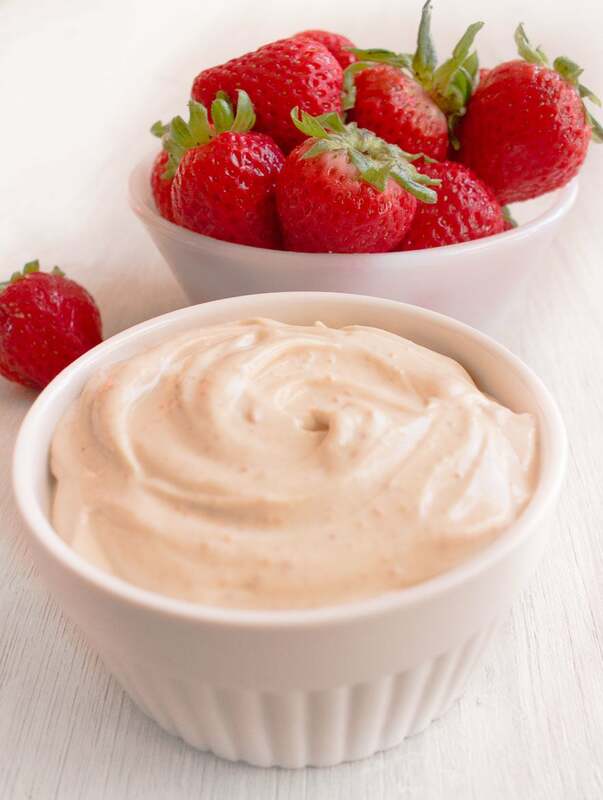 Of course, quality honey makes this Greek yogurt honey fruit dip better, too! If you want a low carb fruit dip, substitute the natural sweeter Stevia for the honey for a true keto fruit dip! Add a little at a time to taste. We like Sweet Leaf SteviaClear drops, because there’s no added alcohol or other sweeteners. Get Sweet Leaf Stevia on Amazon here. Add Greek yogurt, peanut butter and honey (or stevia) to a medium bowl. Your yummy dessert dip is ready! 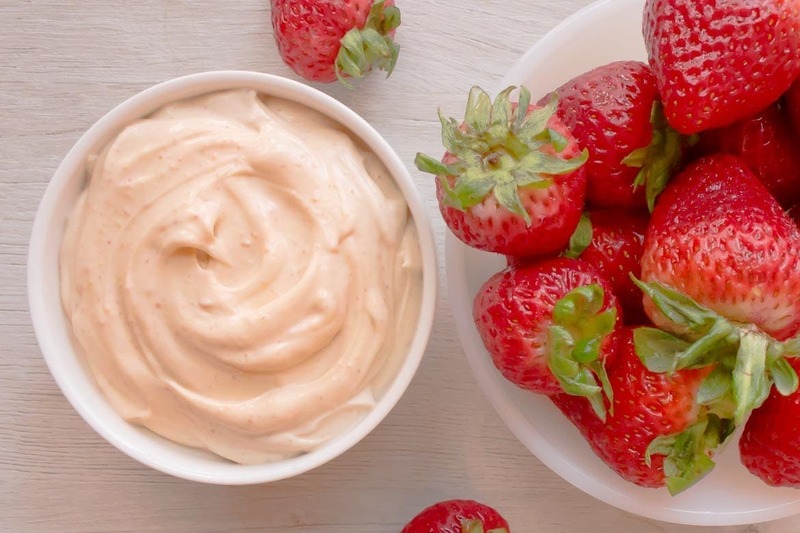 We serve this peanut butter yogurt dip with fresh fruit, but you could also serve it with cookies. Can I freeze this Greek yogurt dip? Yes, you can freeze this dip. However, freezing it does have an effect on the texture – it get s a little more grainy. I would eat it fresh if at all possible. Can I substitute regular, vanilla or flavored yogurt? Of course! Just keep in mind that regular (non-Greek) yogurts have less protein,and often have added sugar and additives. Because regular yogurt isn’t as thick as Greek yogurt, the dip will also likely be thinner. Can I make it ahead of time and store in the fridge? Yes, this is a perfect make ahead dip! It keeps beautifully in the fridge for a few days. Just give it a stir before serving! A good whisk makes mixing this so easy! This OXO Good Grips 11-Inch Better Balloon Whisk is fantastic – it’s sturdy and lasts forever. See it on Amazon now. Ramekins for individual servings. I’m in love with little white ramekins. They make dips looks so beautiful, and they’re perfect for individual servings. See these K Basix white porcelain ramekins on Amazon here. Don’t forget to try the delicious caramel apple dip as well! If you want a low carb fruit dip, substitute the natural sweeter Stevia for the honey for a true keto fruit dip! Add a few drops at a time to taste. We like Sweet Leaf SteviaClear drops, because there's no added alcohol or other sweeteners. Using stevia instead of honey brings the per serving nutrition information to: calories 100, carbs 4.6 g, fat 5.6 g, and protein 7.5 g. That sounds pretty keto and low carb to me.